A proto-communication can be defined as a condition, in which all thinkable is gathered before distinction is made. It is the unity of all human thinkable. Everything is in everything. Not in a way like the old medieval depiction of a macro- and a microcosm, because that implied that a (two) division has already taken place into a large (nature) and small (human) world. The proto-communication has not reached that stage. Participants are mingled in a large pool of undivided interrelationships, with no means of expression to fix a relation. Its features are comparable with the First Quadrant, which preceded it. The same universality occurs as far as time and place are concerned. However, an important difference exists as well. Whereas any division and motion was unimaginable in the First Quadrant, there is a distinct possibility to experience these primal ingredients in the Second Quadrant. An a priori-decision was taken at the boundary of the First and Second Quadrant. The proto-communication offers an endless, boundless and stable universe – much like the highly theoretical universe of Parmenides with no beginning and no end – but it does not stop there. The infinity offers in the Second Quadrant a choice, which it did not before. ‘We seem to face’, said the astronomer Edwin HUBBLE (1937; p. 66): ‘as once before in the days of Copernicus, a choice between a small, finite universe, and a universe indefinitely large plus a new principle of nature.’ He pointed to the ‘old’ principle of the shift of spectral lines (the red shift). If they no longer hold the only key to the motions in deep space, what else would do? 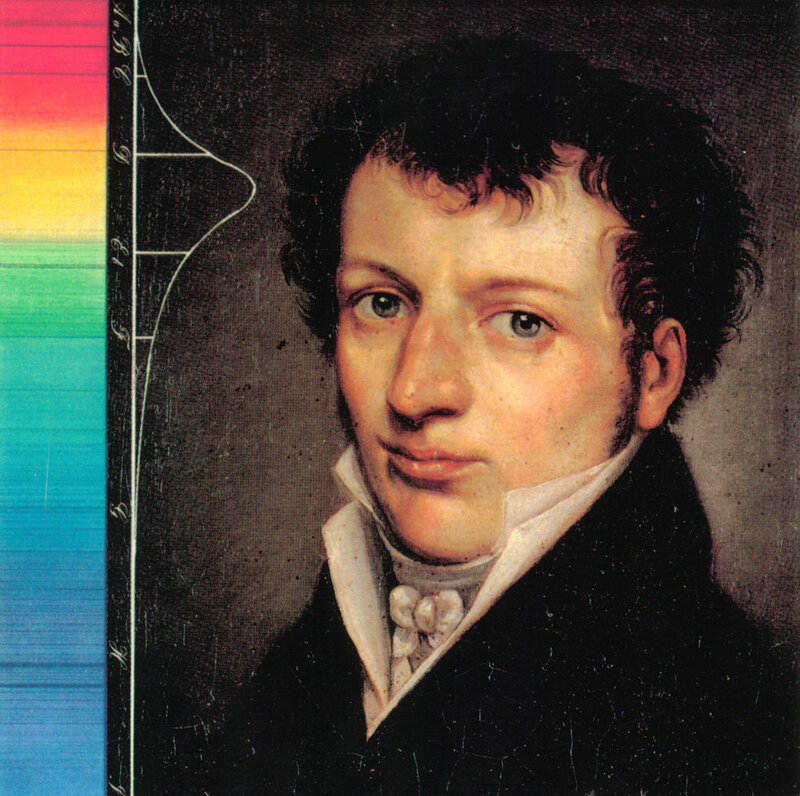 Joseph von Fraunhofer (1787 – 1826), a pioneer in higher division thinking. In: PREYSZ, Carl R. (1989). Joseph von Fraunhofer. Optiker – Erfinder – Pionier. Stoppel-Kaleidoskop 203. Stoppel Verlag, D-8120 Weilheim. ISBN 3-89306-203-3. Quadralectic Architecture – Marten Kuilman (2012), p. 528: The lines of Fraunhofer (which were visible in the spectral analysis of light) opened up a fascinating cosmic world and allowed judgements on far-away galaxies. This was the outcome of the new visibility, based on axiomatic assumptions, and reaching into the Four Corners of the universe. It provided understanding, which had been lacking for so long, because the frame of understanding had been too simply and rigid. The present assumption sees the intergalactic space as a void. And by definition, a void lacks contents. So the light, which travels through the void, cannot interact. This assumption excludes all physical phenomena. The only possible explanation of shifts of spectral lines in light from distant nebulae becomes relative motion. This assumption is based on an anthropocentric view of our surroundings. The physical explanation of the universe brushed in this place along its philosophical base. And it must be admitted that the Doppler effect, popular known as the heightening pitch of a passing train or racer, was always regarded in a dualistic setting, with a fixed observer and a moving object. The red shift of stars assumes a definite point and an entity in motion. The first entity embodied in a human observer, the second in a distant star.